Starting in 2006, for GlobalMS, an area called Shalom Temple, with a Jewish priestess and a giant Menorah inside became available. It looks very similar to Happyville, and was even renovated at the same time. The area was known for giving out the legendary Gelt Chocolates, which granted 120 weapon attack. It is accessible by Simon, an NPC found in Ellinia. Simon will return players to their previous location once they've finished. In 2006, it was only available for the month of December. 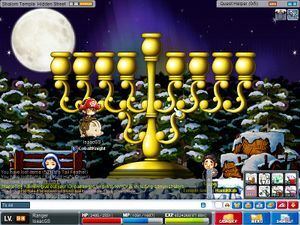 For the Hanukkah events in 2007, it was available from December 2007 to mid-February 2008. This page was last edited on 23 August 2013, at 17:18.